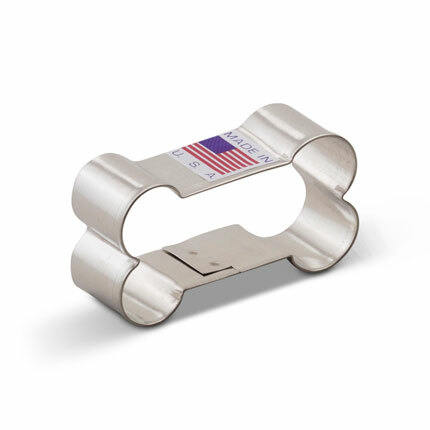 Dog Bone Cookie Cutter, 2 1/8"
1 1/4" x 2 1/8"
This is our smallest dog bone shape, and makes for an excellent size for biscuits for a smaller breed. 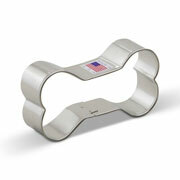 The Dog Bone Cookie Cutter, 2", will make your doggie feel pampered as can be- but it's not just for canines! 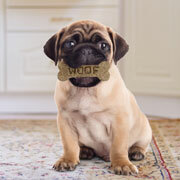 Their human owners will also enjoy using the shape for decoration or crafting, or even (human edible) cookies. 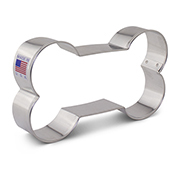 Size: 1 1/4" x 2 1/8"
Dog Bone Cookie Cutter, 5"
Size: 2 3/4" x 5"
Dog Bone Cookie Cutter, 3 1/2"
3 1/2" x 1 7/8"
Size: 3 1/2" x 1 7/8"
The ordering of these items was easy plus you have a nice selection. Was surprised the order arrived in such a short time. I am very happy with the service I recieved when I ordered my two dog bone cookie cutters. The cookie cutters shipped in just three days. I definitely recommend buying and using Ann Clark's Cookie Cutters!